A fatal accident Tuesday along northbound Interstate 35E near the Oak Lawn exit halted traffic on nearly every major highway near downtown Dallas. A fatal collision between a pickup truck and an 18-wheeler blocked three lanes of traffic on Stemmons Freeway and caused a domino effect everywhere else. All traffic coming into downtown Dallas from other highways slowed to a crawl. The cause of the accident is still under investigation, but how did one wreck stop Dallas traffic in its tracks? It's not a mystery, one transportation official said. Blame the Mixmaster, a group of congested, aging highways. An interview with Tony Hartzel of the Texas Department of Transportation. 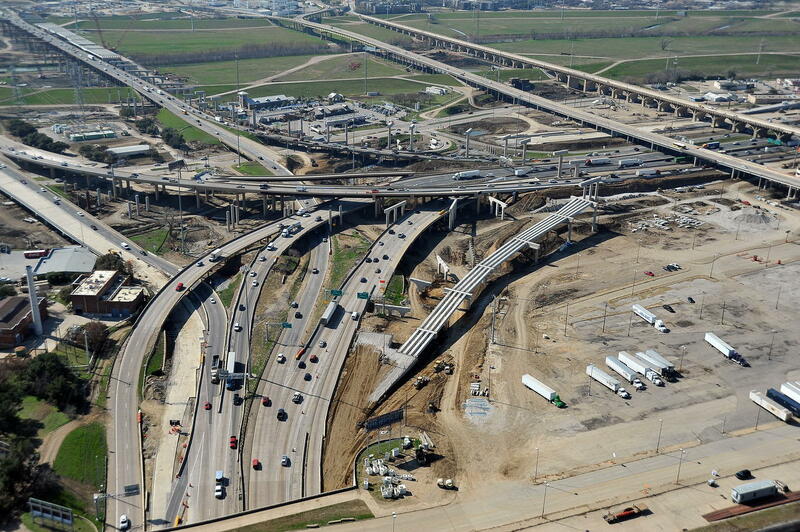 Hartzel says about 242,000 vehicles travel through I-35E. In comparison, about 400,000 vehicles are using the Mixmaster to get to downtown Dallas. The multiple on- and off-ramps on the interchange also presents a problem for TxDOT. According to Hartzel, the Mixmaster presents one of the biggest challenges for North Texas transportation officials. But there are other areas causing traffic headaches: I-35E and Central Expressway is one of the busiest sections of road in North Texas, as well as the High Five interchange in North Dallas. 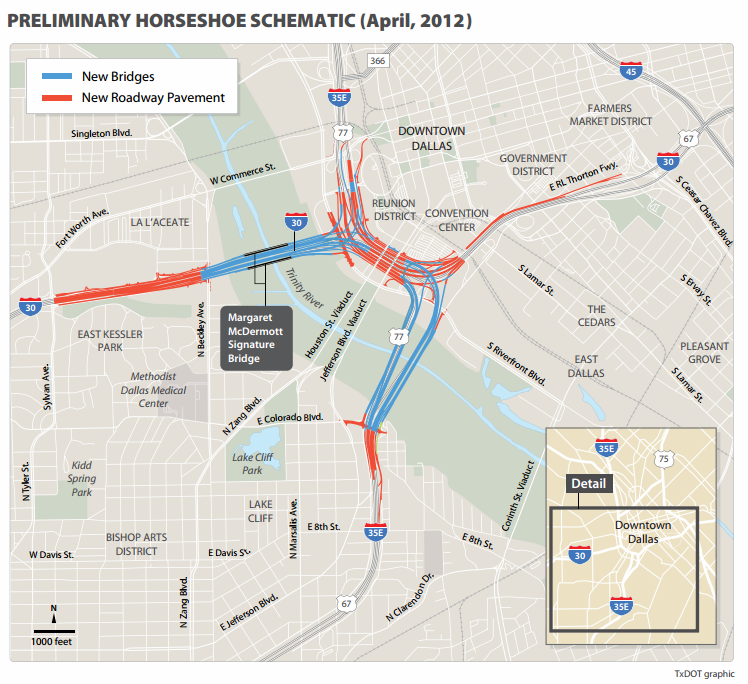 A look at the Horseshoe Project in Dallas, which aims to alleviate congestion near downtown. TxDOT is replacing part of the Mixmaster with the “Horseshoe Project.” And North Texans hope that eases the traffic crunch in that part of Dallas. The estimated $818 million project will include replacing the I-30 and I-35E bridges over the Trinity River, and creating extra lanes. It's expected to be finished in 2017. Dubbed the “Horseshoe Project” due to its U shape, construction improvements include the expansion, repaving and addition of several new bridges and roadways along Interstates 30 and 35E; and the construction of a new signature bridge, the Margaret McDermott Bridge, over I-30. Several changes are in the works for highways near downtown Dallas. It's part of the Horseshoe Project. The President George Bush Turnpike and Dallas North Tollway interchange was a traffic nightmare Monday afternoon, but it should be ready for Tuesday morning's commute. Columns are sprouting, highways are being rerouted and displaced drivers are fuming. Managers of the “Horseshoe” project, which is remaking part of downtown Dallas’ highway system, say the pain will eventually bring relief.